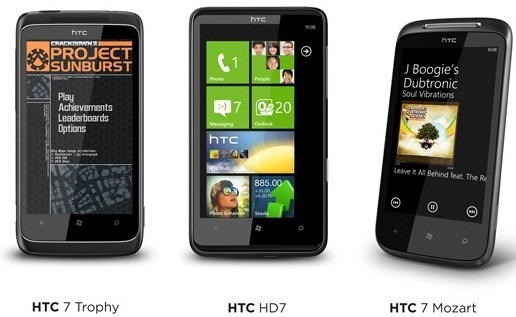 I have always been partial to HTC’s Windows Mobile devices. The first real smartphone I ever owned was a HTC Cingular 8125, running Windows Mobile 5.0. That was such a long time ago. But now with advent of Apple’s iPhone and tons of new Android devices, Microsoft seemed to of slipped off the radar in the mobile technology world. I was a little hesitant at first, I didn’t think Windows Phone 7 was going to be all that great, but after checking out the new HTC HD7, I quickly changed my mind on the matter. Microsoft’s longtime partnership with top phone maker, HTC have put together a real strong initial lineup of some really cool Windows Phone 7 devices. Today being start of the first wave of launches in parts of the world, including New Zealand and parts of Europe. The rest of the world will see a November 8th launch. Below is a quick rundown of the new phones, and what markets will be carrying them.